This wine cozy features a unique stitch pattern reminiscent of a bunch of harvest grapes. And with easy-to-crochet handles and a pretty drawstring, it’s ready to delight any host or hostess. 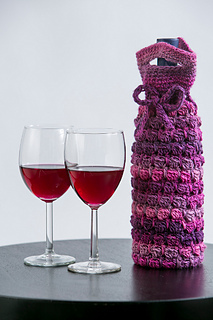 All you need is half a skein of Red Heart Boutique yarn to make this gorgeous wine cozy.